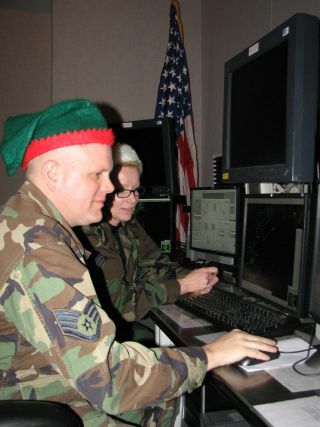 Two members of NORAD's Northeast Air Defense Sector prepare to track Santa using radar equipment in December 2008 . Anybody wondering when to put out the milk and cookies this Christmas Eve can track Santa Claus' epic journey around the globe, from magical start to mythical finish. The North American Aerospace Defense Command, or NORAD, will keep an eagle eye on jolly St. Nick's movements Monday (Dec. 24), beginning with Santa's reindeer-powered liftoff from the North Pole. You can follow along at the "NORAD Tracks Santa" website on the fateful day. NORAD — which ordinarily watches out for missiles, aircraft or space vehicles that could pose a threat to the United States or Canada — will use four different types of resources to keep tabs on Kris Kringle Monday, officials said. First, radar installations near the North Pole will flag Santa's departure. Then a constellation of reconnaissance satellites will watch St. Nick fly, taking advantage of a unique characteristic of his lead reindeer. "Amazingly, Rudolph's bright red nose gives off an infrared signature, which allows our satellites to detect Rudolph and Santa," NORAD officials explain at the Santa-tracking website. A global network of high-speed "Santa Cams" — which are used just once a year — also capture photos and video of the gift-laden sleigh as it speeds by. Finally, Santa will get some chaperones as he enters North American airspace. "Canadian NORAD fighter pilots flying the CF-18 fighter jets intercept and welcome Santa to North America," NORAD officials write. "In the United States, American NORAD fighter pilots in either the F-15, F-16 or the F-22 get the thrill of flying alongside Santa and his famous reindeer: Dasher, Dancer, Prancer, Vixen, Comet, Cupid, Donner, Blitzen and, of course, Rudolph." NORAD has been tracking Santa every year since 1958, when the binational organization was formed. But the tradition actually began three years earlier with NORAD's predecessor, the Continental Air Defense Command (CONAD). In 1955, a Sears Roebuck & Co. branch in Colorado Springs ran an advertisement with a telephone number that kids could use to call Santa. But the number was misprinted and actually put children through to the CONAD commander-in-chief's operations hotline. "The director of operations at the time, Colonel Harry Shoup, had his staff check the radar for indications of Santa making his way south from the North Pole," NORAD officials write. "Children who called were given updates on his location, and a tradition was born."